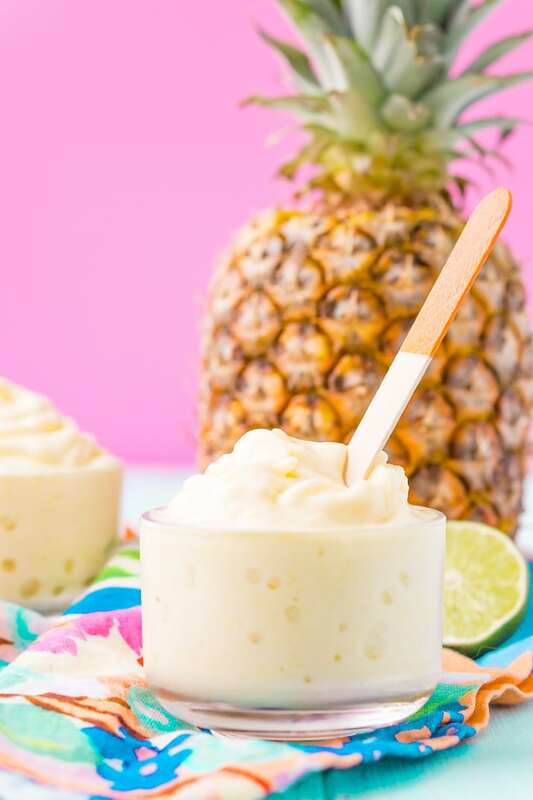 This Dole Whip recipe is a copycat of the famous Disney soft serve pineapple, banana, and coconut treat we all know and love! But you can make it right at home with just 4 ingredients and a blender! I’m guessing if you’re reading this post you probably ended up here because you miss Disney, but you don’t exactly have the vacation time and a few thousand dollars to make a trip happen today. So a bowl of Dole Whip and a viewing of Moana will have to do. So this isn’t the recipe for Dole Whip that Dole has listed on its website, but honestly, I think it’s better, mostly because it’s thicker! That being said, it’s still a soft-serve treat and will melt fast, especially in the heat of summer! 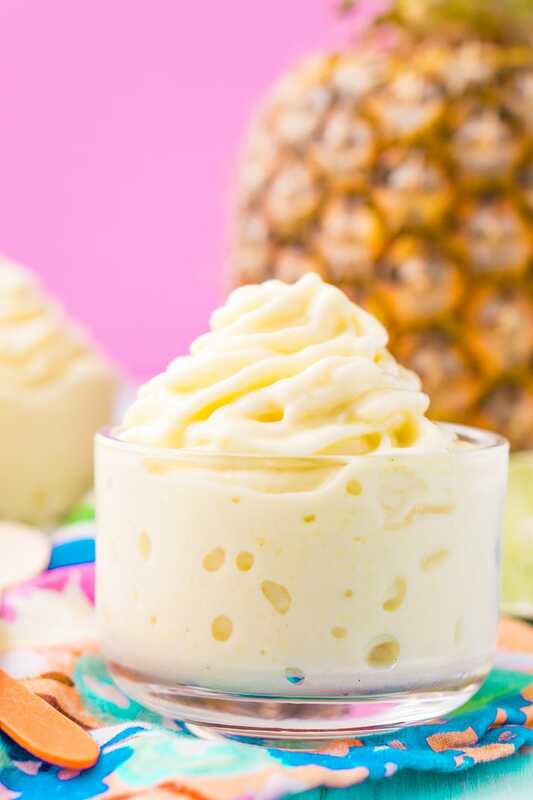 It’s a pineapple flavored soft serve dessert that’s only served at Disneyland, Magic Kingdom, and Disney’s Polynesian Resort and the Dole processing plant in Hawaii. 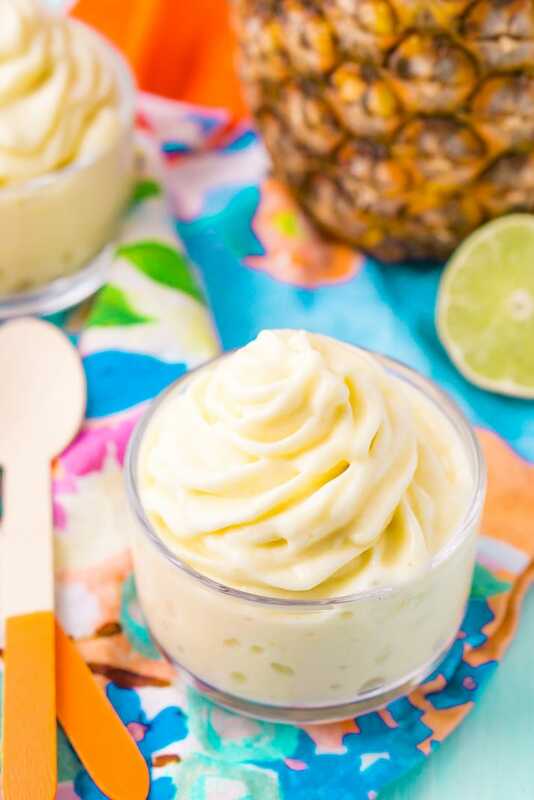 It’s made with frozen pineapple and banana, coconut milk, and a touch of sugar. 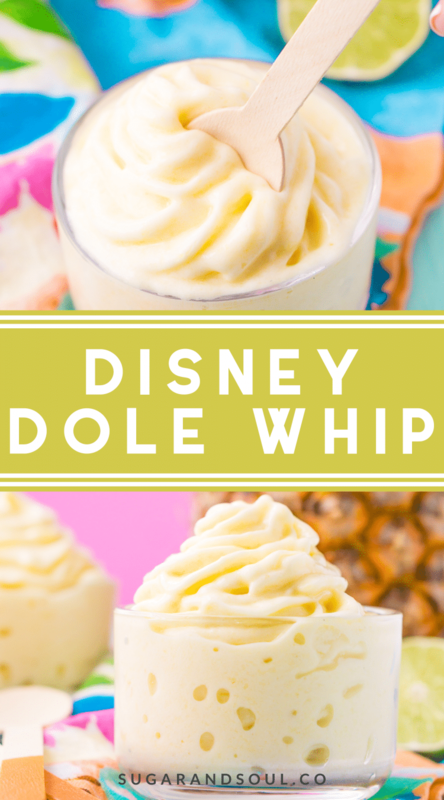 How Do You Make Dole Whip? It’s as easy as combining all of the ingredients in a blender and pulsing until a smooth, creamy, soft serve is rendered. You will likely need to use a rubber spatula to scrape down the edges during blending since the mixture starts off pretty thick. You can use either canned coconut milk or the stuff that you find in the carton in the refrigerator section at the grocery store, completely up to you. However, if you use the canned stuff, I would scoop out the top layer of cream and just use the liquid milk from the can. You want to make sure that your pineapple and bananas are both frozen, this is what gives this treat it’s thick texture, if they’re not frozen you’ll have something closer to a smoothie. If you’re using store-bought frozen banana slices instead of freezing a banana yourself, use about 1 cup of frozen slices. Don’t add ice, we want this to remain thick and creamy. 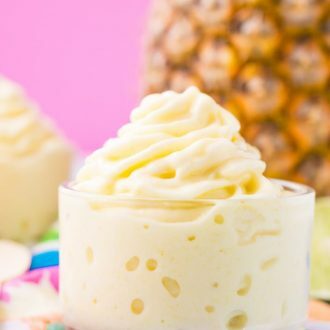 I like using powdered sugar to sweeten my dole whips because it doesn’t add additional liquid which could increase melt, but you can leave it out altogether or try swapping it for honey or agave if it’s a concern. 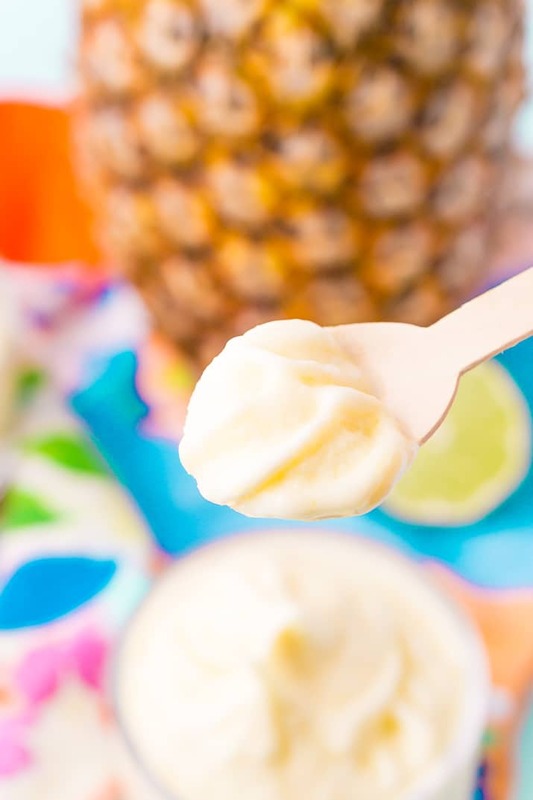 Pin This Dole Whip Recipe for Later! Add all ingredients to a blender and pulse until a smooth and creamy soft serve texture is achieved. You will likely need to use a rubber spatula to scrape down the sides of the blender in between pulsing to make sure that all of the fruit chunks get blended. You can use either canned coconut milk or the kind that you would find in a carton in the refrigerator section at your grocery store. If using the canned stuff, DO NOT mix the solid with the liquid, simply scoop out the top layer of cream and use the liquid that has settled at the bottom. If you're using store-bought frozen banana slices instead of freezing a banana yourself, use about 1 cup of frozen slices. This is delicious, but best with canned coconut milk as it has more coconut flavor. I haven’t had the Disney version to compare it to but I will make this again and again, thank you! I’m so glad you enjoyed it, Faith!